I have left the heavy swells and lumpy seas of Queensland behind and flown south. 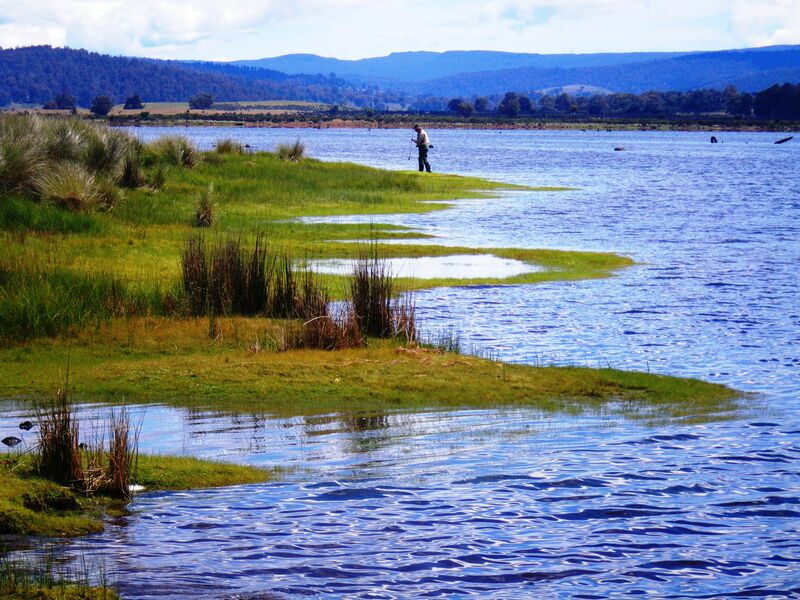 I am lucky enough to be staying at the Taraleah Lodge in the Tasmanian Highlands, where I am hoping to catch a few Trout. I opted for a guide as I needed to know when to fish, where to fish and what to fish with. I brought the light spin rod and reel and a range of soft plastic and hard bodied lures, but I accept that in such beautiful country, fly fishing is really the method by which Trout should be caught. My father, who is is an accomplished fly fisherman, was with me and I am keenly aware that he considers prospecting with soft plastic lures rather similar to dynamite fishing. 1 – Your fly catches in the undergrowth behind you, on the long grass or trees, on the first back swing. 2 – You fly hooks firmly into your ear on the second back swing. 3 – Your dummy cast skims the surface of the water with a loud splash, spooking every fish within ten metres. 4 – The line goes back nicely over your head but as you bring it forward it concertinas in front of you and the fly – lands less than a metre in front of you. Finally, a full two minutes after the Trout has swum away you put the fly where you want it. Put simply, it’s hard and I really struggled. Murray, our guide, took us to the Bronte system which consists of four lakes created in the 1950’s as part of the hydro-power scheme that sends power across Tasmania. He started us off on the western shore of Bradys Lake where trout can often be seen in the shallows. There was a light cool breeze ruffling the water at about 10.00 am. There were various insects buzzing above the water, in the shallows and every now and then a small Dun would pop up on the surface. The Dun is a small winged insect and it emerges from a larva that has matured on the bottom of the lake. When it’s ready to hatch it floats up to the surface and the wings pop up like a little sail. They then blow around on the surface, drying out until they are ready to fly away. The Trout will eat them at all stages of this cycle, but they get particularly excited when there is a big hatch and the Duns are popping up all over the water. You can either target them with a fly that looks like the larval stages (nymph) and sinks – a ‘wet’ fly, or you can target them with a fly that sits on the surface – a ‘dry’ fly. If you want to cover both bases you can tie on a dry fly with a wet fly trailing underneath. This was the set up my guide gave me. It has the added advantage of making it easier to spot a fish strike. When the dry fly (in this case a black foam bug with a red and yellow dot on its back called a ‘Chernobyl’) is pulled under, you strike. We fished for an hour at Brady’s Lake and then our guide suggested a move to the southern corner of Bronte Lagoon. This was another shallow area with weed clumps, tree stumps and fallen trees and it looked very promising. As we arrived a good size Brown Trout broke the surface to snaffle something. We started casting wherever we saw the fish rise. But my poor casting made it tricky. After another hour I was casting more effectively and I was able to put the fly close in to a clump of weed where a fish had been repeatedly feeding. Murray suggested I just let the fly float past – no need to strip line to move it – just let the wind push it past the weeds. I did this a couple of times and then to my surprise the Trout came to the surface and took a swipe at the Chernobyl, instead of the trailing wet fly. I jerked the rod up but I missed the fish. We carried on until about 2.00pm but I never got any closer to catching one. It was a good introduction to how tricky this type of fishing can be. 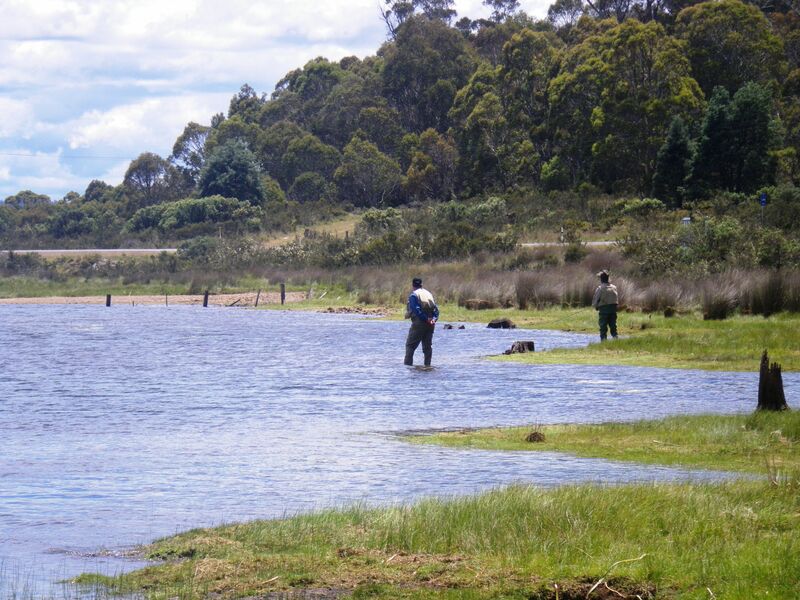 This entry was posted in Fishing Reports, Tasmania and tagged Bradys Lake, Bronte Lagoon, Brown trout, Chernobyl, fly fishing, landangler, tasmania, Trout fishing. Bookmark the permalink. You definitely are living the dream!